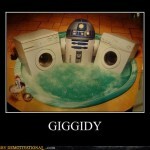 R2’s pimp hand is strong. Working two hot pieces of machinery in the hot tub. You know that’s how he rolls.